And so we come to the third film in our “South Indian Cinema Induction Programme” – Yamadonga. Yamadonga features enough gilt to dazzle even our well trained Bollywood eyes, demonic antics from Lord Yama and some fantastic and well choreographed fight scenes. This is a film from the same director as Magadheera, and SS Rajamouli certainly knows how to entertain. His stories are engaging and full of action. This is no exception! Yamadonga also features NTR Jr, grandson of NTR and renowned as one of the best dancers in the business. NTR Jr although a fine figure of a man, somehow just does not look like a dancer despite his much vaunted weight loss and fitness regime of late. And then he just pulls some astonishing moves and we are left gasping and dumbfounded :‘how did he do that – that’s just not physically possible!’ His ability allows the choreographers to push their limits, and those of the poor backing dancers, in order to showcase the amazing technique of this star. His extensive classical dance training is evident in the balance and control he exhibits in both dance and fight choreography. He certainly seems to exemplify the current mould of South Indian Cinema leading men as an all dancing all fighting all action Hero. The film starts with an amulet which has been blessed by Lord Narasimha and is given to the young Maheshwari, known as Mahi. She gives it to a boy she meets at the fair who appears to her as a prince on a flying horse when he rescues her from a broken merry-go-round. 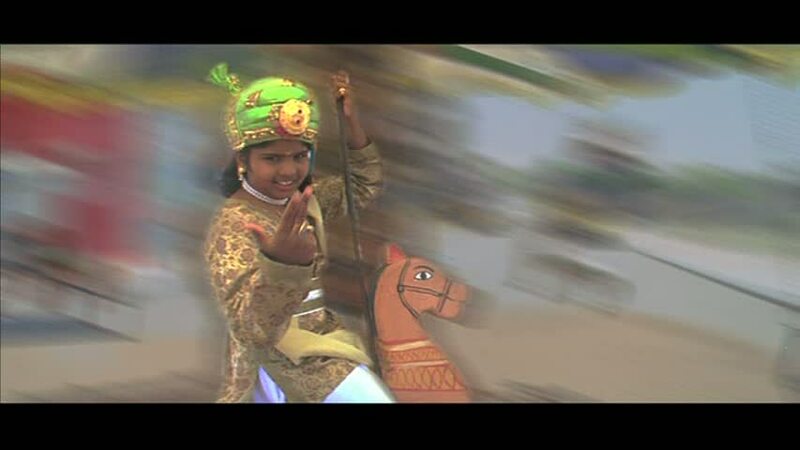 This is Raja, a thief even at this young age, who later tries to sell the amulet. On finding out it is worthless in monetary terms he throws it away, but it always makes its way back to him, in sometimes quite bizarre ways. 12 years later, the young girl is now treated as a servant by her grandfather’s family who have taken over the house and fortune left to her when he died. Raja is a con-artist and thief who stumbles across an attempt by Mahi’s family to eliminate her and assume total control of her fortune. Raja and Mahi cross paths again when she is on the run from kidnappers (hired by her family) and mistakenly takes the dress Raja has been sent to steal. As he defends the dress (and incidentally Mahi) from the kidnappers, she once again sees a prince come to rescue her, but has no idea they have met before. 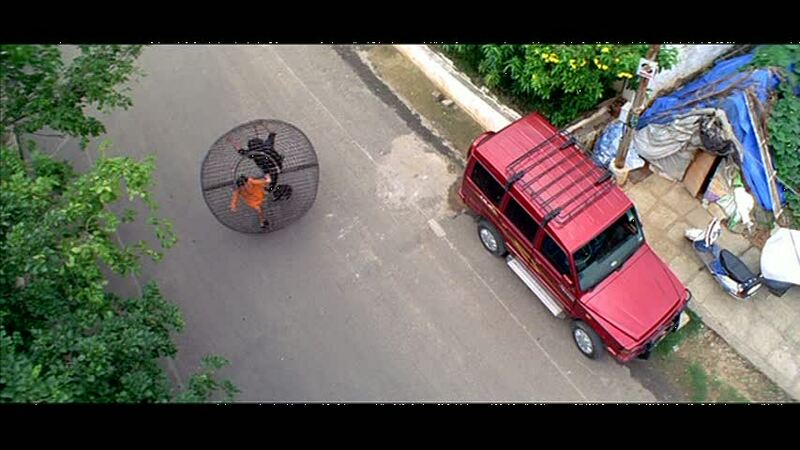 Who else but Rajamouli would have his heroine hurtle around the street inside a gigantic wire ball, with the hero in pursuit battling goons, disrupting traffic and generally creating mayhem as he rescues her! Raja tries to get rid of Mahi before he finds out that she is an heiress, whereupon he changes tactics and tries to ransom her to the family who really don’t want her back. Earlier, following a failed heist, Raja and his friend Sathi ended up drunkenly abusing Lord Yama, who overheard (of course he overheard – he’s a God!) took offence, and decided to arrange for Raja’s death. Once in Yamaloka (or Heaven as our subtitles call it) Raja manages to create havoc as he ends up in control of the realm. In order to get rid of him, Lord Yama has to return him to life. Things get even more complicated when Raja sees the truth and genuinely falls in love with Mahi, and Lord Yama comes to Earth to try and make Raja sin so that he will have to return to Heaven. There are many twists and turns with some great dancing and inspired fight scenes before Raja finally gets the girl and she gets her prince! The movie does drag a little before the intermission when Raja is in Heaven. This whole sequence could have been shortened in our opinion without losing any of the story. However it does allow for a couple of great dance sequences and a chance for yet more gold and sparkle. The dance scenes are a real highlight of this film. NTR Jr is a beautiful dancer and SS Rajamouli has made very good use of his talents. There is even a picturisation cleverly worked to look as if NTR and NTR Jr are dancing together– an awesome idea, sadly not fully realised due to some pretty clunky CGI work in a couple of spots. Rajamouli’s team make excellent use of modern technology with the sweeping camerawork adding to the sense of speed and movement in the dances. 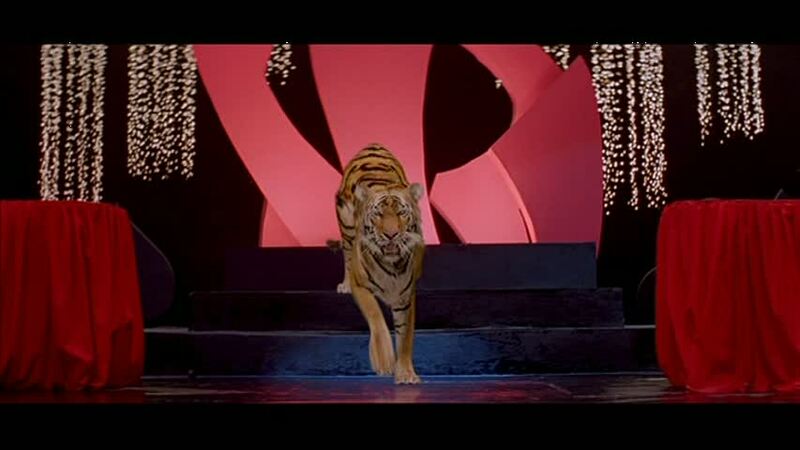 SS Rajamouli’s love of CGI tigers is shown again in one of the best filmi hero entrances when the tiger transforms into NTR Jr! Heaven is wonderfully sparkly and golden, and you can imagine the artistic director just covering anything that didn’t move fast enough in gold paint. Lord Yama and Raja (when he is in Heaven) are fantastically costumed. Priyamani as Mahi is beautifully moving as the girl badly treated by her abusive, grasping family and just joyous when she is falling in love with the oblivious Raja. She is an actress we will watch out for, after this and her pivotal performance in Ravanan. Mamta Mohandas makes the most of her role as the “other woman”, the scheming fence and loan shark Dhanalakshmi, and is great fun in scenes where Lord Yama assumes the form of Dhanalakshmi in order to tempt Raja. There are many clever visual and musical motifs recurring throughout the film, adding to the feeling of destiny at work. Heather says: This is another fantastic film from Rajamouli. He really does know how to tell a story! This is also a great showcase for NTR Jr who combines his awesome dancing skills with some very good acting. In particular his comedy is very well executed, and between Raja, Lord Yama and Chitraguptudu (nicely played by Brahmi) the comedy is very well integrated into the story. Mahi’s character was also beautifully and sympathetically played by Priyamani. Despite playing a downtrodden character for most of the film, she managed to show Mahi as capable of fighting back, and was excellent in her scenes with NTR Jr. Also a word of praise for Mamta Mohandas who really was a delight to watch and did a fantastic job as Lord Yama pretending to be Dhanalakshmi. This was the first NTR Jr film I watched and he totally blew me away with his dancing. Needless to say I now have seen most of his films! Yamadonga does tend to drag a little in the middle when they are in heaven, but the glorious costumes somewhat make up for the slower pace. Overall an excellent film and I give this 4 1/2 stars. Temple says: Yamadonga is a very engaging film, despite the flaws in pacing. I watched it again recently with a friend and it still keeps my attention. One major distraction for me was, I am somewhat ashamed to admit, the appalling hairstyle of NTR Jr. I don’t mind the long hair, but if you’re going to straighten your hair, do it properly! And that includes the back of your head! 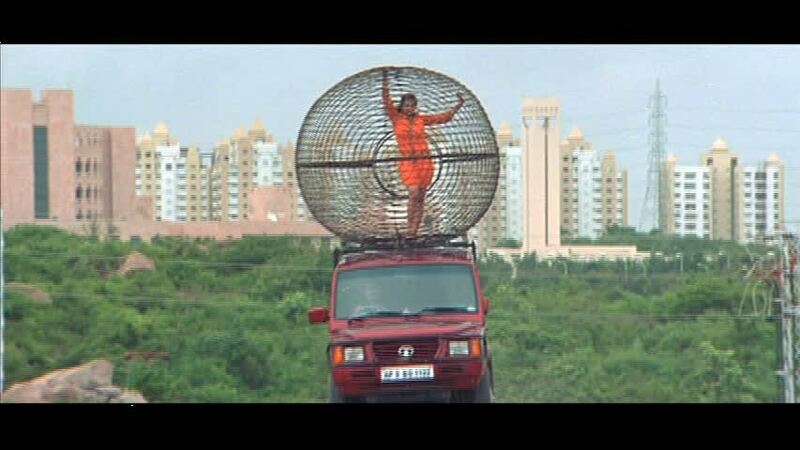 Anyway – apart from the unfortunate 70s era blow-waved Tarak, the rest of the film looked brilliant. Heaven looked so sparkly and fancy and rather like a Faberge egg – it was gorgeous and the attention to detail was lovely. I enjoyed little touches like Yamadharmaraja handing his mace to two soldiers who immediately buckle under the weight, and the cavalcade of NTR avatars. I really liked the wardrobe for the leading ladies too – the colours and fabrics looked great and seemed really appropriate for each character. The songs were a highlight, particularly for the dancing. Priyamani made a fantastic effort to keep up with NTR Jr and her energy was so appealing. On the downside, I really didn’t like Ali’s character in this film, and found his “comedy” track to be irritating. He is my least favourite Telugu comedian at this stage – perhaps because his characters are often a bit sleazy or negative. The film loses a star from me because of the draggy midsection and the really stupid tribal statue skit. I give this 4 stars. This entry was posted in Tollywood and tagged Brahmi!, Mamta Mohandas, NTR Jr, Priyamani, South Indian Cinema Induction Programme, SS Rajamouli, Telugu, Tigers!, Tollywood, Yamadonga. Bookmark the permalink. YAMA HO YAMA!!! I love this movie! I have watched it a rediculous number of times since May when I first watched it. (Over 12 I think plus countless watches of the dances, the “Any Doubt” speech and Tarak’s intro on the Tubes of You) This movie gave the edge to Tarak in my “Who Do I Like Better Mahesh or Tarak Sweepstakes” Since this movie, I have managed to find gold in every Jr. NTR movie I have watched since. (And Yama help me I just watched Naaga and loved it!) Anyways great review! Well, that is what we thought too – but our subtitles originally translated it as ‘meeting place of the Gods’ and then Heaven. So that’s what we went with. Happy to know the correct translation though – thanks! Yes it does drag a bit, but the beginning and the end are great. It must have been amazing to see this with an audience of Tarak fanatics!